2014 Becker Autos War Wagon! Don't forget to stop in to Becker Auto before Thursday night to get your chance to win the opportunity to demo the Becker Autos War Wagon on Friday night in Beloit at the Demo Derby at Solomon Valley Raceway! 1 chance for $5 or 5 chances for $20! 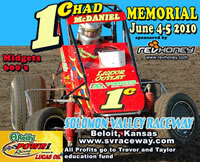 Proceeds benefit the Solomon Valley Raceway!! This weekend Solomon Valley Raceway is preparing the track for another night of smash'em, bash'em demolition derby fun! Friday, August 8th at 7pm we will feature trucks and compact cars. Grandstand admission is $10. Madness of Enduro Racing coming again September 6th at 7pm. Come see the always unpredictable Enduro's as they hit the track for 150 laps or 1.5 hours which ever comes first!